All three contractors checked in this weekend with questions or to say they were still working on the bid. I am taking this as a good sign that they are all interested. Our architect says to figure it will take at least three to four weeks. Meanwhile, to kill time, I went to New York City with KP for our now second annual weekend of extreme self-indulgence. Mostly intensive shopping followed by wine and dinner. 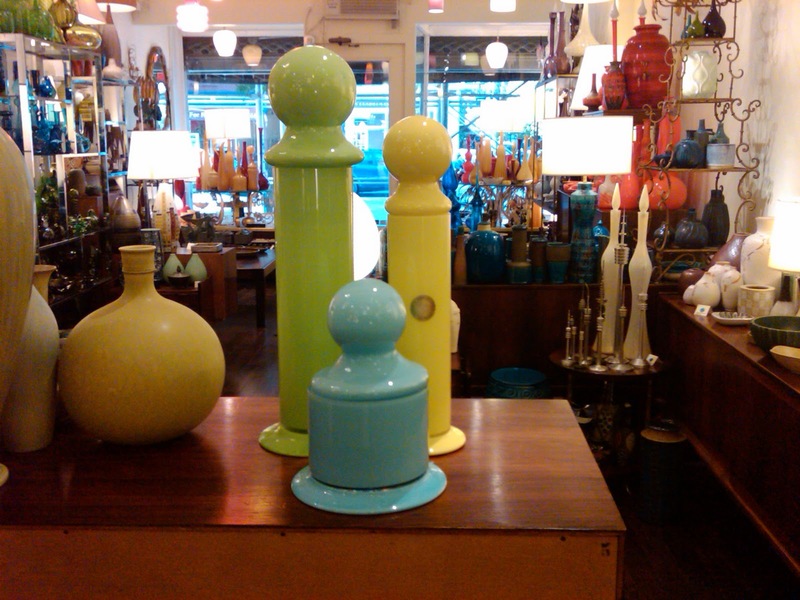 We stopped in at our favorite mid-century modern glass shop, The End of History. Stephen Saunders, the owner, was in and said he remembered us from last time. Probably because of the non-stop self-deprecating chatter. I really loved three pieces from last year. He only had the yellow in the shop, and the green was at a show. The blue had sold. The three pieces I really wanted from the year before. 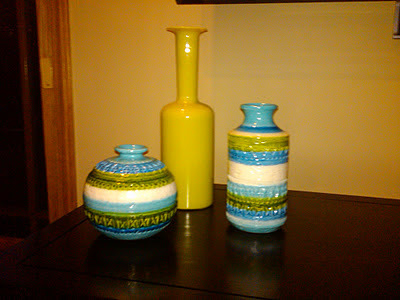 My little Italian glass and pottery collection. I have a real problem with glass and pottery. More about that another day. Met #2 today on my lunch break. He is #2 since he is the second strongest referral -- from a good friend of a good friend of mine. This gentleman was our oldest contractor (between 55 and 60), and definitely had been out in the field today from his dress, and seemed a little rougher than the other two contractors. The architect came over and briefly reviewed the plans with Contractor #2. This contractor seemed a little bit skeptical on some of the architect's ideas, especially concerning ceiling tie-ins from old to new. He asked extremely pointed questions. He also wondered how soon we were looking to start. I said, we could start right away, or work into the schedule, but if we didn't start in October, would want to wait until January due to things dragging out in December. Not sure if that was good or bad. This guy has worked a lot locally in the area and was familiar with NPB codes. Again, good impression. Seems solid. Met Contractor #3 yesterday. He is our least strong referral as he came to me via the designer used by a friend of mind. He may have bid on their project but didn't get it. He ran over to grab the plans and understand the job. He is getting married next week but didn't want to be out of the running, so he was in a hurry and didn't ask a lot of questions. Contractor #3 commented that typically he gets plans on disk now-a-days. I called the Architect and asked about digital plans. He said, in fact, he had ordered digital plans (maybe his first time ever). He emailed them to me and I uploaded to Google Docs. Now we can do business like 21st century home owners. Contractor #3 is between 50-55 years-old, professional and has done many jobs in the Newport Beach area. He made an overall good impression. He looks a little like Tom Selleck. A little. Postscript: he never returned a bid after several communications to us saying he would. He just wasn't a strong referral. Here are the before pictures we are sharing with the contractors. There are a lot of them! The focus for the remodel is adding space to the two original bathrooms, adding a third bathroom, changing the heat from ducting in the slab, to in the walls and finally, a bonus, re-doing the interior courtyard and adding a fireplace and a cover (virtual square feet, if not actual). Before Pictures - A link to the pictures. The Great Tile Debate rages on. I can't decide whether to do the lighter tile on the master bathroom feature wall versus the darker tile (selecting from Timber Glen). It is the first time I have been stumped on a decision with the architect. I think he has admired my decisive nature and wonders if I am just like everyone else and not the super hero client he has always hoped for. On this tile color, I hem and haw for 3 days. The architect is definitely pro dark. My dear friend, KP, who has helped me do lots of stuff to the house, is pro light tile. Husaband is no help because he says he likes them both (chicken). I send a decisive email saying absolutely, positively, light. Then I reverse it 8 hours later. We have landed on the dark after several switches. I am always drawn to color which KP reminded me. The decisions seem real and more final -- selecting the lighter tile, for now. The great tile debate has been raging on for about two weeks. 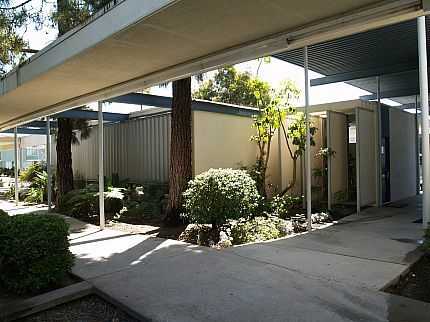 Today, the architect and I are meeting at Daltile in Irvine to put an end to it. The architect is sold on 6x24 linear tile stacked on a feature wall in each bathroom. Not a common size. The tile he selected had little specs and neither of us loved it. I had spotted a tile online and saw it in the store, and voila, it was love at first site. Timber Glen, I heart you for our feature wall. 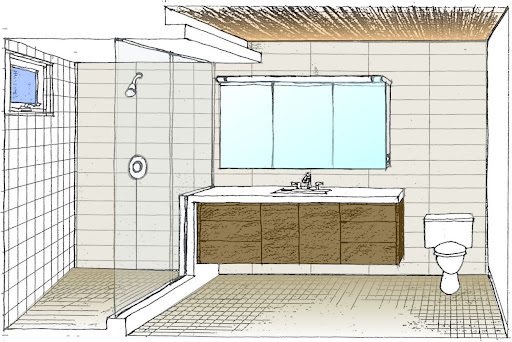 See the finished result, the mid-century modern bathrooms remodeled! Well, I wish I could discuss the research I did, questions I asked, and extensive selection process I engaged in to pick the architect for our low six figure project. I essentially did it with personal references. I talked to two friends I trusted who both had remodels done recently and who were both happy. Both of their architects had a modern aesthetic and I liked the architects' work. Architect #1 was easy to schedule, came over with a portfolio, a CV, a flyer and references. Architect #2 came over with nothing and was challenging to schedule. Architect #1 returned a proposal quickly. Architect #2 took a week or two to return a proposal. Architect #1 had a cheaper hourly rate and Architect #2 was higher (but not crazy higher). Architect #1 specializes in and has a passion for Mid-Century Moderns (our house has vaguely Neutra-esque qualities and was built in 1955). Architect #2 lives in Irvine Terrace (our housing tract) and also built another show stopper in Irvine Terrace, meaning he is intimate with our HOA. Tough choice.